What is Agility you may well ask? 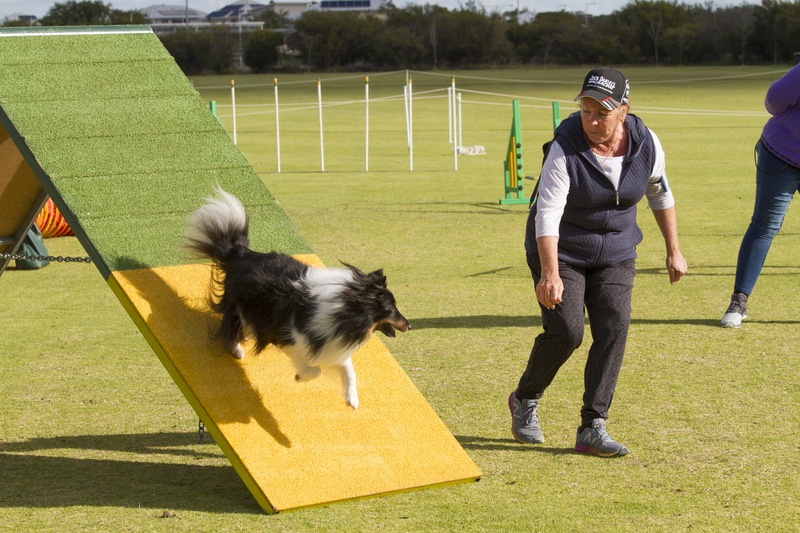 Agility is probably the fastest growing dog sport in Western Australia at the moment. Agility entails your dog completing a course of jumps and obstacles set out in different sequences. The objective is that your dog should negotiate all jumps and obstacles in the designated order as set out by the judge in the fastest possible time. Your dog does this with you aiding him by directing him to the appropriate obstacle in the sequence. Sound like fun!!!!! Well, it is, for both the dogs and the handlers. It is truly and exhilirating sport that keeps both you and your dog physically fit. The Gosnells Obedience Dog Club are very proud to offer our members excellent facilities and equipment to enable them to train their dog in this sport. Firstly, your dog MUST be 12 months of age or over before it is allowed to do any kind of jumping. However, basic training using equipment other than jumps can be undertaken, to give the dog an understanding of what is required and to ensure that dog and handler become a team. Secondly, you MUST have control of your dog off lead. At the very least he will come immediately when he is called and should have a good stay/wait whilst you walk away. Agility is trained predominantly off-leash therefore it is imperative that dogs be under good verbal control. If your dog does not yet have these skills, we recommend that you undertake Obedience Training with our club, on a Sunday morning, which will then enable you to start Agility Training once your dog reaches the Seniors class. These rules have been put in place for the safety of yourself and your dog. ALL AGIILTY PARTICIPANTS ARE EXPECTED TO HELP ERECT AND DISMANTLE EQUIPMENT FROM BEGINNERS TO SENIORS!!!!!!! bringing your dog onto the club grounds. During the winter months, it is sometimes necessary to cancel training due to inclement weather. Please contact Anne Lacy-Herbert on 0417177872 for further information.